June 2012. On village fete duty in Hartley Wintney, Hampshire, UK. 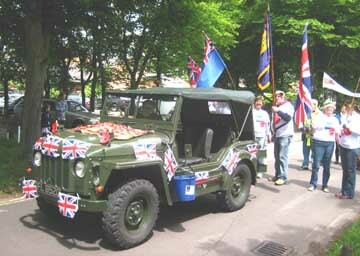 The theme of the fete was the Olympics and the Austin Champ, 26 BE 76, was the Royal British Legion entry. I couldn't think of a way to dress the Champ as something to do with the Olympics so just some flags and poppies. The poppies on the bonnet were just pushed through a hessian sand bag with bungee rubbers holding the hessian on.